Personalized Lemonade Drink Mix is just so refreshing! 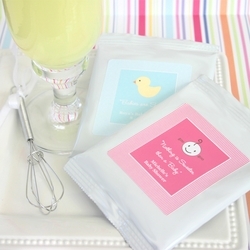 Nothing is sweeter than a precious little baby but our Baby Shower Lemonade Mix sure comes close! Treat guests to this refreshingly sweet summertime drink. A perfect complement to any outdoor and warm weather events. Personalization is included. Just select from an assortment of pics to find the theme design that's just right for you, choose the perfect color, and add your personalized message, names and event date for a truly custom baby shower favor or christening favor that are all your own! Try labeling your lemonade favors with our favorites such as "Babies are Sweet" or "Nothing is Sweeter than a Baby", etc. Our adorable whisks come with a white satin bow and a heart shaped handle that has a small opening so you can easily slip it through a hole. Some assembly required (punching a hole in the lemonade package and slipping the heart handle of the whisk through it.) Personalized labels come unattached from the Lemonade Mix. Size: 5" x 3.25"